Sausage grease is infinitely more appealing in your mouth or on your plate than on your clothing. The high fat content of sausage creates oil-based stains that can become permanent without proper washing techniques. A traditional german sausage can leave a nasty stain on your shirt. Highly absorbent materials, like cotton or terrycloth, will soak up the grease quickly, while other synthetic materials may grant you a few seconds before leaving a mark. Heavy-duty detergent is what you use for towels and pajamas, not delicates. Pour a few drops of heavy-duty laundry detergent directly onto the stain. Gently massage the detergent into the material for maximum absorption. Let the detergent sit on the stain for a few minutes and then wash the item as you normally would, using the hottest water allowed by the garment care guidelines. The heavy-duty detergent binds to the stain-causing compounds and the hot water helps dissolve the grease. Saturate the sausage grease on your clothing with aerosol solvent pretreatment spray. Solvent sprays break down the staining compounds found in grease so they loosen easily in the wash. Allow the pretreatment spray to sit for a few minutes before washing the item while following the instructions on your garment care label. Make a paste using a tablespoon of powdered detergent with a few drops of water and spread the mixture over the stain. Let the paste sit for a few minutes and wash as instructed by the garment care label. Keep in mind that your clothing won't absorb paste as deeply as gel or liquid treatments, so it's best to use this method only if you have no other options. Some sausage grease stains will cling stubbornly after the first washing. If this happens, launder your clothing again using color-safe bleach or standard bleach. Only use this option after checking the garment care tag for the material's compatibility with bleach. 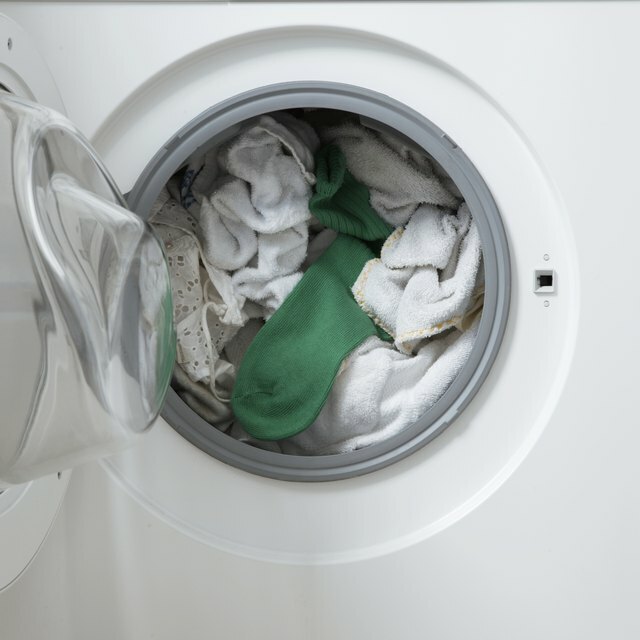 What Causes Oil to Leak in Dryers Over Clothes? Can You Walk Barefoot on Hardwood Floors? How Hard Is it to Get Rid of Fleas in Your House?